Henry Morgenthau, Jr. (1891-1967), the only Jewish member of President Franklin D. Roosevelt’s cabinet and FDR’s closest Jewish friend, enjoyed regular access to the president and belatedly used it to advance the cause of rescue. Morgenthau was the son of Henry Morgenthau, Sr., who had served as America’s ambassador to Turkey during the World War One era. As the proprietor of apple orchards in New York’s Dutchess County, Morgenthau Jr. became friends with his neighbors the Roosevelts. Morgenthau contributed to FDR’s gubernatorial and presidential election campaigns, and was rewarded by being appointed chairman of the New York State Agricultural Advisory Committee (1929), then was named governor of the Federal Farm Board (1933) and, finally, was chosen as secretary of the treasury (1934), a post he held for the duration of Roosevelt’s years in office. Raised in an assimilated German Jewish family, Morgenthau was reticent about publicly acknowledging his Jewish identity and during the 1930s never raised issues of Jewish concern with the president. In 1938, Supreme Court Justice Felix Frankfurter privately derided Morgenthau as one of those Jews who “are preoccupied with saving their own hides and their own ‘positions’ in America and care next to nothing about the lot of Hitler’s victims” (although, ironically, Frankfurter himself rarely mentioned Jewish concerns to FDR). During the voyage of the ill-fated refugee ship St. Louis in 1939, Morgenthau contacted Secretary of State Cordell Hull to suggest granting the refugees temporary haven in the Virgin Islands. When Hull objected, Morgenthau dropped the issue. Morgenthau experienced a significant change of heart in late 1943, when his staff members presented him with evidence that the State Department had been suppressing news about the mass murder of European Jewry and obstructing opportunities to rescue refugees. He was especially incensed when his aides showed him how Assistant Secretary of State Breckinridge Long had doctored a telegram related to disguise the fact that State had been blocking the transmission of news about the killings. At the urging of his staff–and possibly in response to a threat by one of his aides, Josiah E. DuBois, Jr., to instigate a public scandal–Morgenthau finally confronted President Roosevelt on the rescue issue, in January 1944. He presented FDR with DuBois’s report exposing the State Department, and urged the president to pre-empt the pending congressional rescue resolution by unilaterally establishing the War Refugee Board. Roosevelt did so. Although it was the combination of congressional pressure and the possibility of a scandal that primarily motivated FDR, the fact that the appeal was coming from his longtime friend and cabinet member was also a significant factor in forcing Roosevelt’s hand. 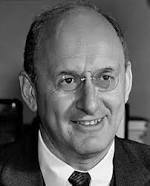 Officially, Morgenthau was one of the three cochairs of the new rescue agency, the War Refugee Board, along with Secretary Hull and Secretary of War Henry Stimson. However, in practice the Board was run from the Treasury Department and staffed by many of the same Morgenthau aides who had challenged the State Department on rescue in the first place. He gave them wide latitude with the Board’s affairs, occasionally stepping in to use his position to facilitate their work. The refusal of the State and War departments to cooperate with the Board became a source of tension between them and Morgenthau during the final months of the war. Wyman, The Abandonment of the Jews, pp.183-187.